The importance of knowing about the Datum[ref 1] recently came to my attention as I was working with GIS data on a Language Documentation project. We were collecting GPS coordinates with a handheld GPS unit and comparing these coordinates with data supplied by the national cartographic office. End goal was to compare data samples collected with conclusions proposed by the national cartographic office. Where on the grid a point is (Coordinates). Which grid is being referenced. This information about a datum is vital for a project which is creating data with the intent or the foreknowledge that the data might be combined or mixed with data from other projects. Which Datum to use in publications? GIS information is already in a technical field which nobody speaks natively. Freely available tools do use the international de facto standard. In the case which I mention in the first paragraph, we were mixing data from different datums, so we needed to choose one datum to work with. Because the national datum was not the global standard and freely and publicly available tools like Google Earth and Google Maps use the global de facto standard WGS84WGS 84 is the default datum used in most GPS equipment, but other datums can be selected provided that the functionality is included in the hardware. we chose to use WGS84 and to convert data points from the national datum to WGS84. [ref 3] But this meant that we had to convert mass amounts of coordinates from one datum to another datum. What about converting between datums? Not all GIS coordinate converters are the same. There are variations in the margin of error in conversion, and there are also variations in the methodology[ref 4] of the conversion (variation in methodology is not bad, but rather a necessary thing when considering that there are different types of gridsOn the matter of grids, there is a difference between the projection of a map[ref 5] and the datum.). It is important to cite the conversion tool, the date of the conversion and the method the tool uses. If the conversion is done manually, cite the methodology on how the conversion was done. Without being a geologist or a cartographer, I recommend internet based conversion utilities hosted by national cartographic institutions over those at academic institutionsSome Desktop GIS tools also have build in conversion utilities.. But this does not mean that the ones at academic institutions are inherently bad, or less accurate. And in all probability, I would most likely use the one offering the best User Interface[ref 6], provided that it had the features (conversions) I needed. This utility from the Resource Coordination Network, a collaboration between Montana State University and Yellowstone National Park, is no longer maintained and is not accurate for converting coordinates in the southern hemisphere. But does convert between several datums and several coordinate notations. This utility permits the user to convert latitude and longitude between decimal degrees and degrees, minutes, and seconds. For convenience, a link is included to the National Geodetic Survey's NADCON program, which allows conversions between the NAD83 / WGS84 coordinate system and the older NAD27 coordinate system. NAD27 coordinates are presently used for broadcast authorizations and applications. Earthpoint is a paid service which adds some data handling features to Google Earth. They have a free service which allows a user to enter a latitude/longitude or position. The service will then convert the position to the desired notation system. The service supports the following: Lat/Lon, UTM, UPS, MGRS, USNG, Georef, and State Plane. The service uses the WGS84 datum. Decimal has decimal degrees -73.9874°. Sexagesimal has degrees, minutes, and seconds -73° 59′ 14.64″ .Sunearthtools.com has a very helpful conversion tool for converting between these two formats. Let's take a look at the constituents of what a coordinate is and then at several notation systems in use. Basically, there are three parts to the coordinate. (A coordinate is a point on the grid is where two or more coordinates intersect as would be the case with the addition of altitude.) This roughly corresponds with the X (North-South/Latitude), Y (East-West/Longitude) and Z (Altitude) axis on a three dimensional grid. A coordinate has components in Sexagesimal notation which are known as: Arcdegrees (degrees), Arcminutes (minutes), and Arcseconds (seconds). Using the latitude N 41 53.4168 as an example for a mixed notation between decimal and sexagesimal, we can represent this same location as N 41° 53′ 25.008″ in Sexagesimal notation, or as 41.89028 in decimal notation. All three notations refer to the same location. Using various notations in the same project can be a source of confusion (not recommended when avoidable). In a Language documentation project to be clear to consumers of the data, use the same notation consistently throughout the project (it helps a lot when trying to do geographic based visualizations of the data collected.). Don't ignore the decimal point (or the spaces), if you are compiling coordinate data from sources which use those notation formats. If a decimal point is there, then is could be that the seconds are represented as a fraction of the minutes, or it could be that the seconds are expressed as a decimal.Latitude and Longitude have the maximum error in the equator, because the earth's radius is maximum. The accuracy of the longitude increases the further from the equator you get. The accuracy of the latitude remains almost unchanged. If the Earth is assumed to be oblate spheroidal with size as determined by IAU in 1965 (6378.160 km - At the equator, 6356.775 km - At the pole, f=1/297.0) then the earth's radius at the equator is 6378.160 km. (In 1976 the IAU standardized this radius[ref 13] as 6,378,140 metres (6378.14 km or 20,925,656 ft), subsequently refined by the IUGG to 6,378,137 metres (6378.137 km or 20,925,646 ft) and this 1976 value adopted in WGS-84, though the yet more recent IAU-2000 has retained the old IAU-1976 value.) This would mean that the circumference is (r*2*pi) 40075.1612 km, so each degree is (40075.1612 / 360) 111.319 km. Precision choice of 5 decimal place is accurate to 1.11 meter (+/- 55.5 cm) at the equator. N 41 53.4168 is read as 41 degrees and 53.4168 minutes North of the Equator. Thus, 53.4168 minutes is the same as 53 minutes and 25.008 seconds, or simply 53′ 25.008″. The third format, 41.89028 is just the degrees as a pure decimal number. Take the fraction, .89028, and multiply it by the number of minutes in a degree. Thus, .89028 x 60 = 53.4168 minutes.Thanks to http://www.divespots.com/scuba/storyID-40/viewStory.blogs for explaining and laying this out for me. The following table shows some of the variation in the GIS Coordinate Notation Types. These examples are compiled from Sunearthtools.com and Earthpoint.us. dd.dddddd dd.dddddd Without the degree symbol. DD degrees.decimal° 41.89028° N 12.49248° E N, S, E, W are all marked. Sometimes these values are not marked with alpha characters but are assumed to be marked with a + or a - sign. And sometimes the + sign is omitted. DD 41.89028 , 12.49248 Comma separated with a trailing space. DM GPS N 41 53.4168 E 12 29.5488 This is a common GPS output format which does not use symbols but does separate the degrees and the minutes with a space and marks the hemisphere with an alpha character (prefixing rather than suffixing). ddmm.mmmm dddmm.mmmm No spaces between degrees and minutes or º and ´ symbols. The seconds are not expressed individually but rather as a fraction of minutes. ddmmss.sss dddmmss.sss No spaces between degrees, minutes and seconds. Seconds are expressed as a decimal. UTM Universal Transverse Mercator coordinate system 15S 303705mE 4314711mN Additionally there are other formats of notation like: UPS, MGRS, MGRS Polar, USNG (identical to MGRS), Georef, and State Plane. Altitude can reveal data points which can be used in an analysis considering anthropological factors. i.e. when considering the migrations of people groups or trade routes to consider where speakers of different languages might have had contact or mixing. A discussion following a question asked by Michael Steger on gps-forums.net. There is also the basic question of what is altitude? There are a multitude of different ways that altitude can be measured[ref 16] . Imbedding in the question of what is altitude is also the question "what is the definition of 0? ", or "Where do you start counting?" However, before we can really answer the question on "Where do we start to count from? ", or "Where is the 0 mark?" We need to introduce some different kinds of shapes. 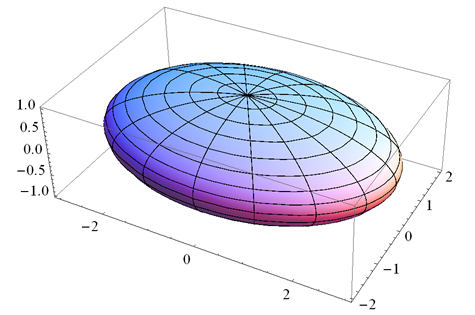 An ellipsoid is a three dimensional object with three possible radii. One for the X-axis, one for the Y-axis, One for the Z-axis. None of these radii must be the same length. 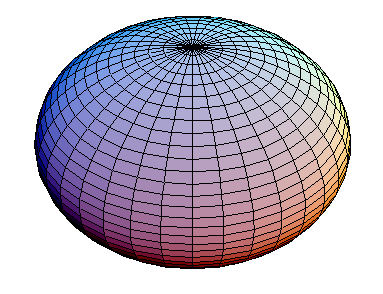 However, if all three radii are equal, the solid body is a sphere; if two radii are equal, the ellipsoid is a spheroid. 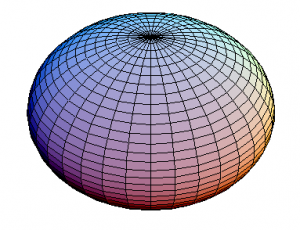 A spheroid[ref 17] is an ellipsoid with two axis of equal length. The Geoid[ref 18] is that equipotential surface which would coincide exactly with the mean ocean surface of the Earth, if the oceans were in equilibrium, at rest (relative to the rotating Earth), and extended through the continents (such as with very narrow canals). According to C.F. Gauss, who first described it, it is the "mathematical figure of the Earth", a smooth but highly irregular surface that corresponds not to the actual surface of the Earth's crust, but to a surface which can only be known through extensive gravitational measurements and calculations. Notice based on the above diagram that if the someone was standing on the top of the green line with a GPS receiver there would be different measurement from the green line to the blue line (Geoid) than there would be from the green line to the red line (Ellipsoid). So basically as I understand it, a datum like which is the basis of measurement with GPS devices and is used with WGS84, is based on a spheroid and is related to a mathematical model on a consistent geometrical shape. However, most topographical maps are based on a datum which usually based on a Geoid type shape. This can create a noticeable difference between Topographical maps and GPS readings. This also explains why sometimes sea level is not 0 altitude when taking a GPS reading[ref 19] . The two very different approaches are of the nature that the GPS system is based first off of a mathematical model and then the dirt falls where it may. Whereas the Topographical model for representing things says: "Where is the dirt? let's show that on the map." This entry was posted in Access, Cartography, Digital Archival, GPS, Language Documentation, Linguistics, Meta-data and tagged Coordinates, Datum, GIS, GPS, Language Documentation, Language Maps, Map making by Hugh Paterson III. Bookmark the permalink.